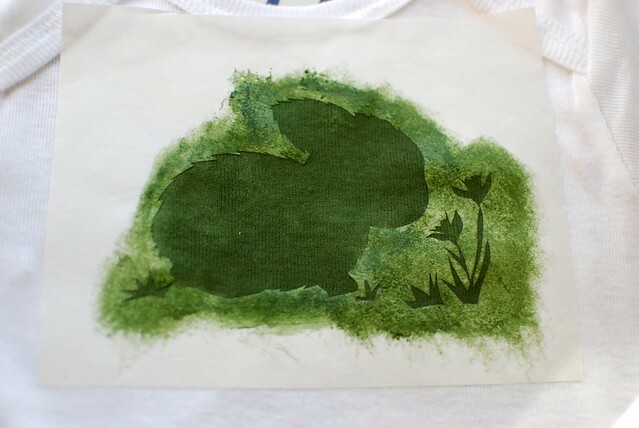 This weekend was a whirl wind of crafting, drafting, and computer complications. It was busy inside and beautiful weather outside. I wished I had spent more time enjoying the weather, but when my mind is able, and the kids are otherwise occupied, there is no stopping these crafting fingers. Working hard on this blog, this creating, building these tutorials is a new intentional commitment for me. I've been blogging for a few years now. Sometimes with fervor and exuberance and sometimes not. The need to express my creative side, connect with others, and build a new revenue stream for our family are the currents that pushed my blogging hobby along. I know that the act of creating, and the discipline to keep creating, can lead to some of the goals I'd love to achieve in the this lifetime. All these thoughts and feelings have led me to the brink of choosing to a path. But fear is holding me back from stepping off and committing. Lately I've been praying a lot and asking for guidance. Which way should I go? How much should I be concentrating on my family? How much should I be concentrating on my creative talents? What should I be giving and how much? What is it that I am meant to do? I was reading this passage in the Catholic Herald today and it really hit home for me. In her March 8-14, 2012 Opinion piece, Elizabeth Foss wrote, "St. Isaac of Stella wrote, 'If you desire to know yourself and possess yourself, go into yourself, and do not search for yourself outside. Distinguish between what is around you, what belongs to you, and yourself! Return then, transgressor, to your heart within, where you are truly yourself.' So much of what we believe about ourselves and the way we see ourselves is a reflection of the interactions we have with other people. Moment after moment, day after day, we store up a lifetime of impressions from without. The opinions and the attitudes of other people can shape us, nearly to our very core. But those impressions cannot touch the innermost reality of who we are. It is only the Holy Spirit in whose likeness we are created who can truly shine a light on who we are intended by our Creator to be, who we become if we are fully united to Christ. A quiet intimacy with God is the truest way to know ourselves." Many things I've been reading lately are subtly pointing me to this creative outlet, this blog. I love creating new things. I adore working with my hands and designing. God has a funny way giving me tiny hints and pointing me in the right direction just when I think I can't stand it any longer to not know. I very much enjoy working on these posts and sharing my creative work with others. I hope that you also enjoy what I am posting here and it is useful for you. Stay tuned for more soon! Today, it is just a quick post. I am working on something a bit more complex for later this week. 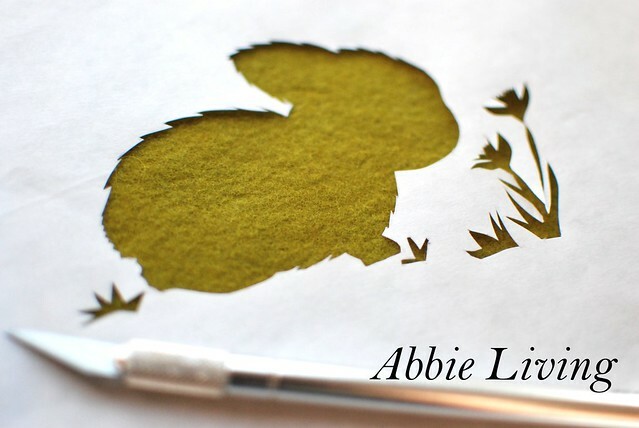 This is the a little baby bunny stencil pattern. Downloadable here. 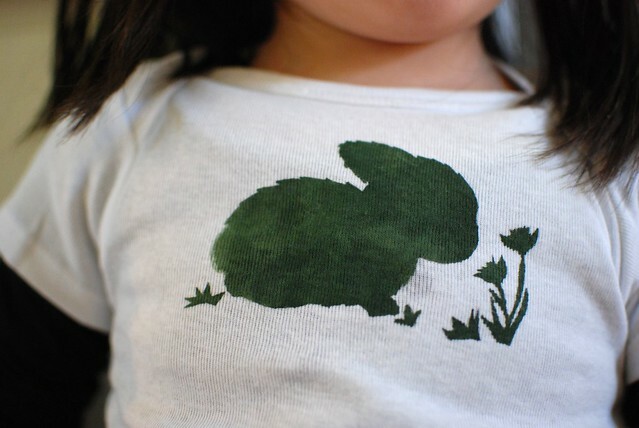 Click here for the tutorial about how to create a sweet stenciled little baby tee.. I couldn't for the life of me get a good shot of the finished tee. This crawling baby can cruise at 9 months!! Yikes. 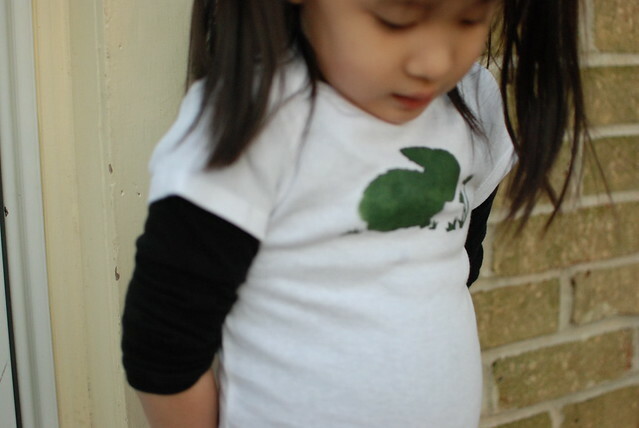 And my 4 year old is a little shy about modeling. *sigh* So these funny ones are the ones I get.